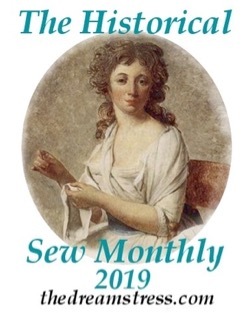 The Historical Sew Fortnightly Monthly 2015 is on! I’ve been incredibly busy this week, so I’m a little behind on getting answers to all the bits and responding to people who offered help. I’ll be putting up a HSF ’15 page with all the information (other than being monthly the main guidelines of the HSF will remain basically as they were last year) up in the next few days, and a button out for you to pin on your own blog if you have one. Hopefully there is something to make each of you thrill with delight, and something to thoroughly challenge each of you – and that’s just as it should be! So what do you think of the challenges? Which one thrills you, and which one will challenge you? Oh hurrah! Hopefully we’ll see just a few things from you then, but I understand if you really need a break! My two favourite colours as well. I like the challenges this year–they seem to be a bit more…open…to guys. All themes seems to be interesting, I’m really excited for this challenge and I hope I can do all of them. Ooh, I already have my one for January! March will be easy – just find some more curtain fabric! August and October are really interesting, I can’t wait for those! For me, April and November will be the challenging, but what will really be hard is finding time for all this!! You are a real inspiration to me: I love your website! What a great list! Out of Your Comfort Zone is very challenging! I want to get all my books out and start searching for something completely new and foreign. Blue thrills me! A) it’s my favourite colour; B) I can use the kacabajka for it and make up for my Politics of Fashion failure! So excited by the Sewing Secret challenge ! And War&Peace (make me think of Sybil in Downton Abbey), Practicality, Silver Screen…All of them actually. Can’t wait to begin ! Oh man! The year I dedicated to finishing every single challenge forced me to use my two least favorite colors in the world. And next year I figure I won’t be participating much, and the color challenges are two of my absolute favorites. I may have to make the time for those. I think I will have a better chance of finishing all of the challenges this year – at least I will give it my best try. Oo, the excitement! I don’t know how many I’ll manage but I do believe I’ll give it a try. Although pretty much everything I do will qualify for the June challenge – Out Of My Comfort Zone! Four projects that I fell behind on this year fit the themes for January, February, March, and June. I can probably come up with projects for a few more months if I think of it…and re-do is a perennial favorite. 🙂 Thanks for keeping HSF as a monthly! The seamstresses in Australia/New Zealand, could co-ordinate with a Returned Serviceman’s Club (RSL, as one avenue, and put on a little display at some time over the next four years. Heirlooms and Heritage sounds exciting to me. I did a dress last year that made my daughter look like both her grandmothers at that age. And Silver Screen! I’m in. I love this challenges! In this year i want do all of this 🙂 (June is perfectly, I want to sew XVII’th century dress, but I never sew dress on this period before). Since this is my first time in this challenge, I find all of it challenging! I might be focusing more on knitting though since that’s more my strength for some challenges. My main era of focus is American Civil War and the Reconstruction years. I’ve been doing research for a steampunk story set in this time frame. I know my fabric choices won’t be historically accurate since I’m still building my skills and will be working mostly from stash. Also my projects may verge more in the realm of fantasy than history as I try to build a costume for my character (I hope that’s ok). 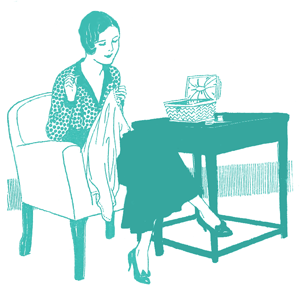 Knitting is just perfect – any creative making clothes form. 🙂 And I totally understand that people have budgets and life realities to stick to (as do I!) so those kind of period inaccuracies aren’t an issue. 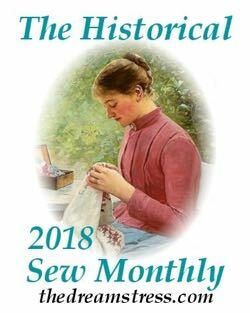 It really is the Historical Sew Fortnightly/Monthly though, so things do need to be historical. If it’s a period piece that you could also use for steampunk that’s totally OK, but one of the main goals of the HSF is to expand historical knowledge, so fantasy is a bit out. Yay! I’m ok with fantasy being out. It’s still important to me to understand a historical period and it’s dress before I can successfully give it a fantasy twist. 🙂 I look forward to learning a lot this new year! So many interest me, but then January, and November, fit with items, I had already planned to attempt in 2015. March, and June would be a definite. Must focus… I’m not sure how many I will accomplish, but I will definitely have to give this a try. Love it! Thanks! Now to get planning on my part! Woohoo – fabulous challenges! Lots which fit in with ideas which I already have, but lots which will push me to try something new as well. I am really going to try and do this this year. Oops! I can’t remember this rule – is combining challenges allowed, as in making something blue from your stash (Feb+Mar)? Or is it just one month at a time? Thanks! One challenge per item please! But if you make a skirt & jacket of that same blue stash fabric that can be worn with different skirts & jackets, the skirt could be one month and the jacket another, etc. My first project is already finished (works for Jan or Feb) but I haven’t blogged about it yet. Are there rules about when it needs to be blogged by in order to ‘count’? Thanks for all the trouble you’re going to with this – it’s much appreciated! Since we are FINALLY getting rain here in California, my sewing room is cleaned up (mostly) and I am ready for Challenges. Great challenges! Especially the colours are really two which I love! Starting to plan…. January is perfect, I’m planning on making a pair of stays over Christmas break! Hopefully this year I can manage to do it all the year through. Last year started off pretty well, but life kind of got in the way. I’m excited to sew what everyone makes! My favorite by far will be the May Practicality challenge because it goes along with my book and museum display No Lady of Leisure ! But I love the monthly thing ( I feel like I can do that and won’t get so down on myself because I can’t accomplish ALL of the challenges) You chose some really nice challenges and I can’t wait to see everyone’s interpretations! Great challenges – I already have ideas for about a third of them, which I guess is a good sign. If I had firm ideas for all of them immediately, there would be less of a challenge. Skimming the contents I can only agree with the hopes for more male participants and garments, it would make the total output even more inspirational. I like both the colour challenges. Stashbusting might be my favourite one, though, since it’ll force me to make a garment which has been postponed a dozen times already. Yay! As for challenging – a lot of them. Out of your comfort zone, obiously, but I think War and peace might be one of the trickier. And monthly challenges are perfect. Less stressful with work and stuff, but still enough to get things done. I’m so in! Already trying to think of what to make each month 🙂 first challenge is perfect for my immediate costuming plans. I am so excited to get started this year, I do not know if I will be able to do all the challenges given my schedule, but I will give it a try! It gives me a very nice excuse to get my sewing room straightened and use some of my ever expanding stash and pattern collection! Can’t wait! Although I’m slightly bricking it as I’m learning the most basic of basics as I go (ie. using a sewing machine for starters…never used one before lol). Could be interested but looking forward to the amazing makes I’ve seen from everyone so far. They all look really inspiring and I have ideas running around in my head. The easiest is the stashbusting, I just have to choose which of my many, many planned but as yet not started projects to select. If I can set up a small sewing space and blog, I might try sewing a 1930s brassiere for challenge #1. I love the idea of a 12 month challenge to motivate me; 30s and 50s are my favorite decades for fashion but I’m not a costumer. Nor is my skill level even ready to tackle an 18th century garment—furthermore what would I use one for? I can’t even remember the last time I wore a Halloween costume. 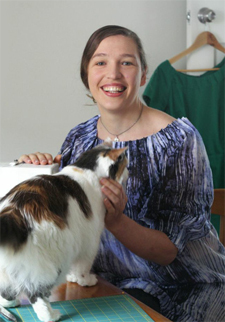 I am a beginner sewer and I have been lurking the online sewing community for like 2 years now. I love seeing what everyone has made, but I have never built up the confidence to try sewing anything myself. Happy to have you participating!